The Order of Canada, one of our country’s highest civilian honours, was established in 1967, during Canada’s centennial year, to recognize a lifetime of outstanding achievement, dedication to community and service to the nation. Over the last 45 years, more than 5 000 people from all sectors of society have been invested into the Order. A interview with Weekly Voice’s Binoy Thomas below. Jha is in a mood to look back and look ahead, at this particular juncture in life. There are family and individuals to thank for a journey that began in a Bihar village bordering Nepal, a journey that would take him from a place that ‘nourished his soul’ to the world’s most happening places. 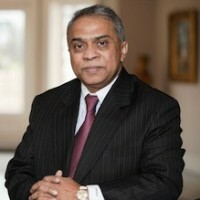 An early believer in the computer revolution, Jha fashioned an admirable career that saw a highpoint around 2003 when he and his partners sold their computer firm for a cool $100 million that made them rich. But Jha didn’t get busy counting his take, or buy himself a yacht to circumnavigate the world. Actually, he didn’t even buy into a prestigious neighbourhood, just to make sure, he has arrived. He still lives in a 2200 sq.ft home in a normal and very decent Mississauga locality. “This is more than comfortable for us,” Jha smiles, perhaps a bit lucky, to have a spouse who believes in the deeper pursuits in life. Instead, he got into a number of projects that supported higher education. Aditya founded his private charitable foundation (POA Educational Foundation) in 2001 and created endowments at four institutions (Ryerson University, York University, Trent University and George Brown College), and various other initiatives. Aditya’s foundation (www.poafoundation.org) has also supported other projects: with Ryerson University a research project on Economic Value of Indo-Canadians; Pathways Education Program for the inner-city kids of Regent Park community in Toronto; Share the Music program of Roy Thomson Hall through endowment to give Canadian aboriginal youth access to best musical performances in Toronto; Infrastructure grant for Canadian Youth Ballet Ensemble for ballet school in Havana and Trillium Hospital, Mississauga; Toronto International Film Festival as Gold Patron; Canadian Museum of Human Rights; 50 student residence for kids from landless families in India ; and Nelson Mandela Children’s Fund and several other charitable projects. He has funded digital literacy project by donating laptop and desktops to 11 schools in Nepal and to the Islamic Institute of Toronto as well has supported Nepal Library Foundation for setting up libraries in the remote villages of Nepal. Aditya along with four colleagues has set-up Canadian Fallen Soldiers Foundation with initial pledge of $1 Million and are in discussions to work out the details to give bursaries for higher education to the families of the Fallen Soldiers as well venture funding for their start-up businesses. Well, a man as driven as Jha, new visions and ideas keep coming, and this list will have lengthened by the end of this year. As he watches the Canadian scene (by the way, he is absolutely in love with this country! ), there are serious issues that he sees enveloping us if we do not take appropriate measures now. Jha is also a very concerned citizen that would like to see what he calls the ‘social calm’ continuing and not turning into ‘social chaos’. One particular section that he spends a lot of time thinking about is the plight of the aboriginal people. “I think aboriginals are an opportunity, if we take a different approach. Or their situation can become a social disaster.” Jha points out that given an exceedingly high birth rate compared to even the immigrants, we need new ideas to see them prosper and become productive. “Almost $10 billion is spent on the community, and still things are not what they should be,” he notes. Jha is not asking for more money to be spent, but a different approach that make communities and individual more productive and responsible. Don’t be surprised if you hear Jha getting involved in this area more deeply in the future. After all, it just might work – here is a an ‘Indian’ with a big heart and some great ideas that can change the fortunes of a community for the better. The latest honour gives him further reason to work harder to strengthen the ideals that drive our nation and work harder for social cohesion. “I see the honour as a responsibility. What can I do to live up to this honour?” he asks humbly. I am sure Aditya Jha, who hails from the land of mother Ganga, will know where to take the next bend in this river.